From Goodreads: "No one knows what happened the night Echo Emerson went from popular girl with jock boyfriend to gossiped-about outsider with "freaky" scars on her arms. Even Echo can't remember the whole truth of that horrible night. All she knows is that she wants everything to go back to normal.But when Noah Hutchins, the smoking-hot, girl-using loner in the black leather jacket, explodes into her life with his tough attitude and surprising understanding, Echo's world shifts in ways she could never have imagined. They should have nothing in common. And with the secrets they both keep, being together is pretty much impossible. My first review of the New Year! HELLOOOOO everyone!!! :D I hope that you all had an absolutely fabulous Christmas and New Year. I have not had a whole lot of time for reading the last couple of weeks. I work in a bookstore and my hours for Christmas were a little crazy. But none the less I had a great holiday period. How was yours? Lets get down to bizznezz. I borrowed Pushing the Limits from a good friend of mine that goes by the name Renee, and well she must be a very patient person. Since I have had her book since about October last year. SORRY RENEE <3. I don't know why it took me so long to read it. I think all the hype around this book had me scared. It shouldn't have though because it was amazing. We have Echo (Echo... Echo... Echo... heh heh! ), she has scars that she doesn't remember getting, that look like they were self inflicted and everyone assumes they are. Only a select few people know what really happened to Echo, and Echo isn't one of them. Her mum tried to kill her, that much she knows. She doesn't know why or how. Her mum has many mental things going on in her head, bipolar disorder and depression. Echo is now the school leper. Everyone thinks she is crazy and suicidal. Then there is Noah. What to say about Noah. He has his own set of problems. His parents died in a fire and only him and his brother knows how it started. He is a ward of the state and has been separated from his two younger brothers are foster kids and he has minimal visitation rights. The one thing he wants in life is to get his brothers back and look after them. Noah makes some massive changes in his life. After meeting Echo he stops sleeping around and he stops smoking weed. I know its incredibly cliche but he does some seriously tough growing up throughout this book. From start to finish he is almost a completely different person, in the best possible way. Echo and Noah don't think much of each other. Echo is just the crazy girl with the scars on her arms and Noah is just the weed smoking bad boy. That's until they get to know each other and see that impressions can be incredibly deceiving. There was just so many emotions for me while reading this. All the feelings! This is where Katie McGarry really shows her skills. At the start of Pushing the Limits I disliked all of the adults in this book, as did Echo and Noah. They had both been let down and lied to by every adult in their lives. Echo's Dad, Mom, Step mum and all of Noah's foster parents. So when they both start seeing Mrs Collins, the new school counsellor, neither takes much stock in her ability and neither trusts her in the slightest. She proves herself though and by the end I loved her character. She has small break through's with Echo and her memory of what happened to her the night she got her scars. She helps Noah get better visitation rights to see his brothers. Then there is Echo's dad, hate, like, hate, love. The same with Noah's brothers foster parents; hate, hate, love. So many feels! I absolutely loved Pushing the Limits and I can't wait to see what Katie McGarry has in store in Dare You To. If you haven't already, this one is a must read. Seriously. If you like the sound of this then check out my past reviews of Beautiful Disaster by Jamie McGuire and Speechless by Hannah Harrington. Both of which are great YA reads with deeper issues. I totally agree it's a MUST-READ! It was definitely one of my favs from 2012... and I can't wait to read Dare You To!!! Great review Amy - so accurate about the feels! Dare You To is AMAZING! I hope you enjoy it! I really enjoyed this book too! It was definitely one of my favorites of 2012. I plan on reading Dare You To ...hoping it is just as good. Great review! YES! 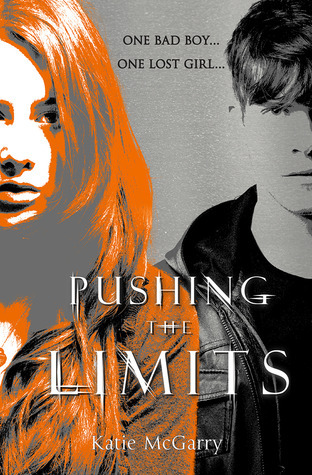 Pushing the Limits is amazeballs! ;) Noah makes me swoon just thinking about him! Ahhhh....This is one of my favorite books that I read last year. :) Dare You To is going to be awesome! !